Happ stays on the roster, it's finally time for Game 1. ESPN's computer picks the Dodgers in 6, maybe 5. The simulation thinks the Phils will have trouble with LA’s bullpen. 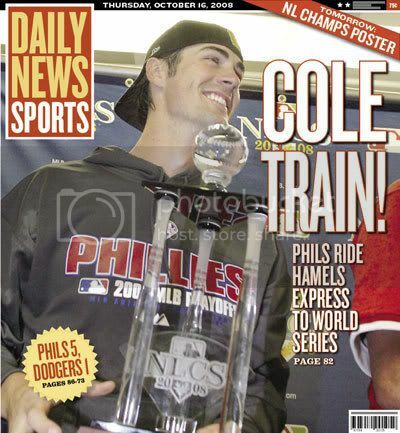 Young Cole Hamels seems like he's becoming an ace at age 24. 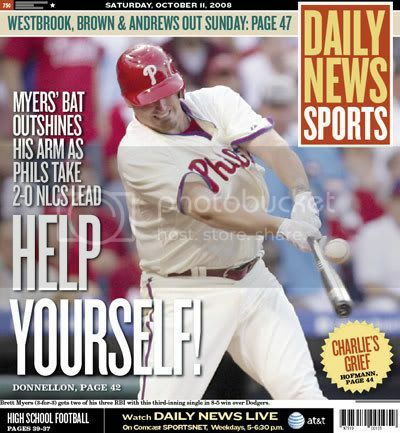 Big win, but sad news as Charlie Manuel's mother has passed away. 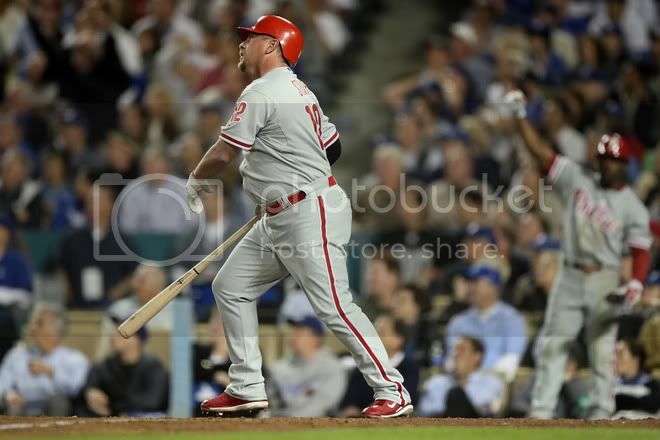 Heavy hearts, but the game goes on...let's see if Brett Myers can pitch (and bat) as well as he did in the NLDS. In addition to the Manuel/Ramirez photo, another surreal thing in this series--especially for those who remember the Phillies-Dodgers NLCS battles in the '70's--is Bowa being in a Dodgers uniform and Lopes being in a Phillies uniform. Lopes got the last laugh in the '70's. Who will get it this year? 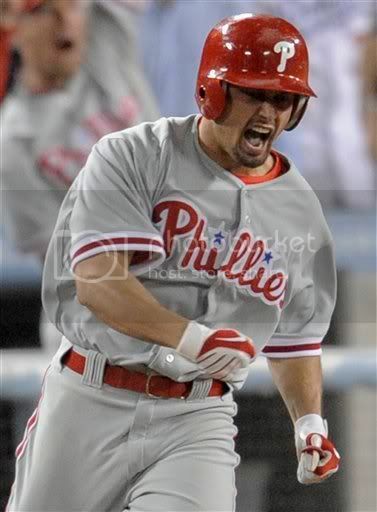 Big win has us up 2-0, but more sad news as Shane Victorino after the game learned his grandmother passed. He had a great game as did Brett Myers, at least as a batter. 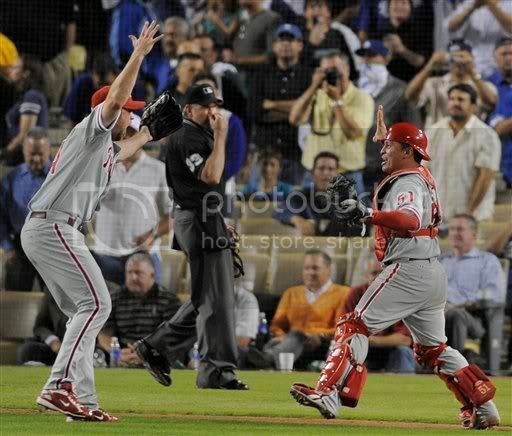 NLCS teams that go up 2-0 have a great record, so let's hope there's not another Game 3 letdown in LA in a couple days. Off day, both Vic and Charlie say they won't miss any games despite being in mourning. When Myers drew that walk and Vic hit that GS it was honestly just a matter of playing the games out. I knew we had it, I just had no doubts about it. This was a really, really fun team. Probably the most memorable moment for me. I was on my way to a diner date and was listening to it on the radio. I couldn't believe my ears! Moyer knocked out early, pessimism starting to creep in. Some are arguing to move Hamels up a day, but we're sticking with Blanton. 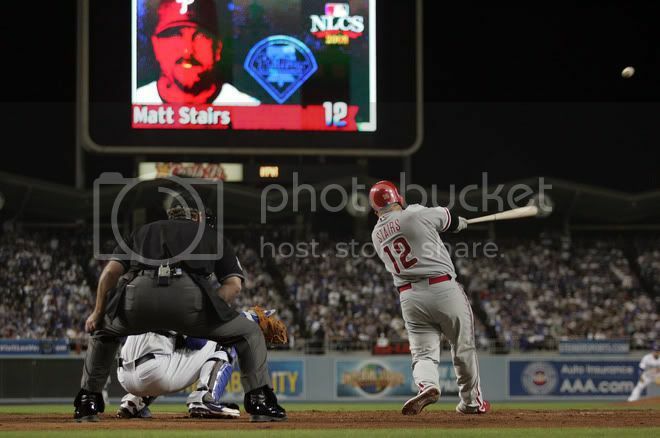 "Stairs rips one into the night!" 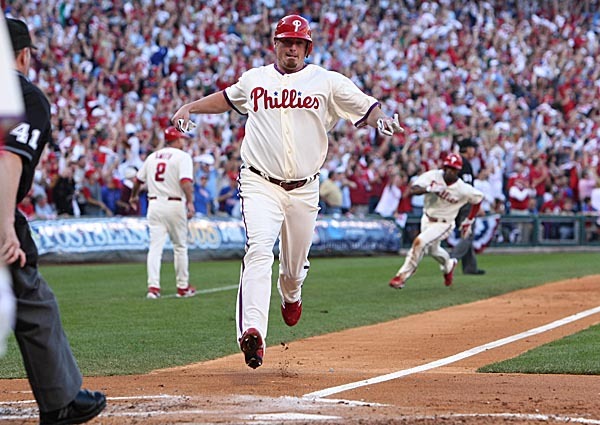 Vic's homer will be forever underrated, more crucial, yet less majestic, so a footnote to the Stairs one. Yes, that was huge. Stairs shot, however, was basically--SPOILER ALERT!--the knockout punch for that entire series. Dodgers went quietly after that. 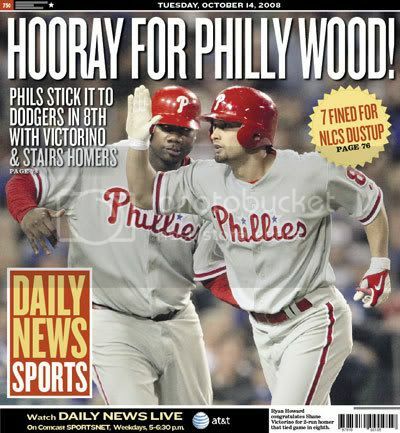 I was there and the Vic home run felt like more of a miracle to me. I mean, the game was almost over down 5-3, whereas the 5-5 game could have gone on for a while. 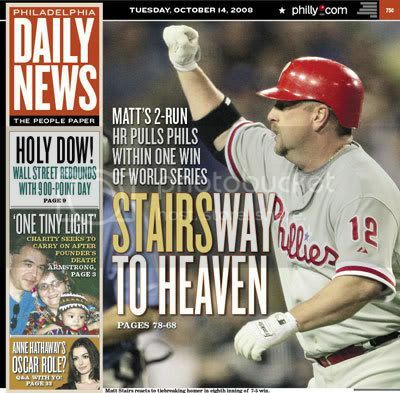 But still an incredible moment (also the person I was with half-seriously predicted it, he was a huge Matt Stairs fan). 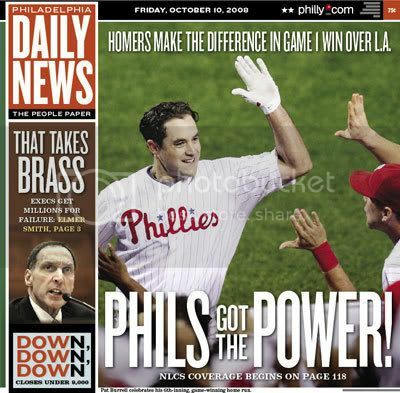 Yes, to me, there was talk that the Vic slam in the NLDS made people think it was 'our' year in 2008, but it was his homer in this game that removed a large amount of dread for me. 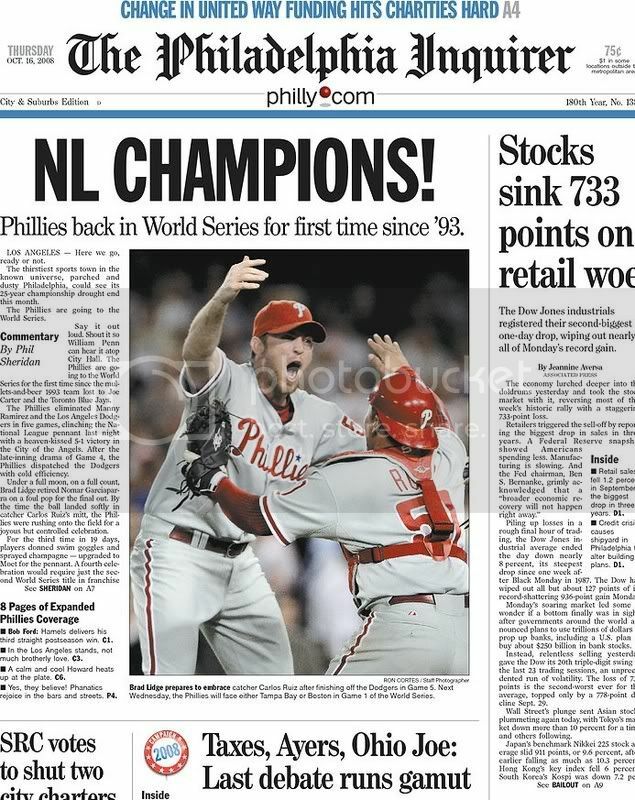 Well, it was certainly going to be a long, tough series had they not won Game 4, but Phillies still would have been in control unless they'd lost Game 5. It did seem like LA rolled over once they lost this one. Conversely, not to get ahead of things again, the Rays still believe if they'd won Game 5 they could have taken both home games. I don't remember feeling that way at the time but I certainly expected there to be a Game 6. All those games had moments that seemed "meant to be" (but we'll get to those soon enough). Blanton can't hit at all. For some reason, last night's thread ends up in the 2009 archives. Musta been a memorable game or something. 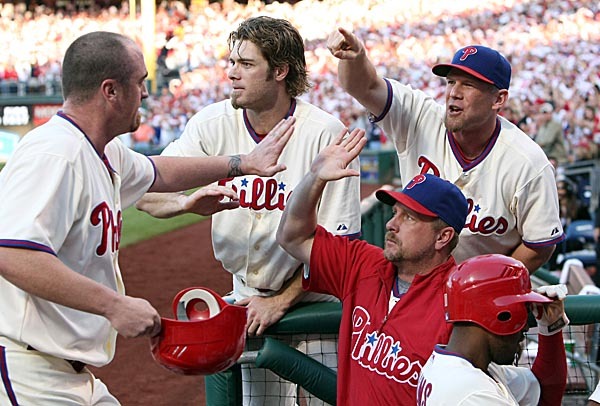 Anyway, Phils are up 3-1 and can clinch a return to the World Series in Game 5. 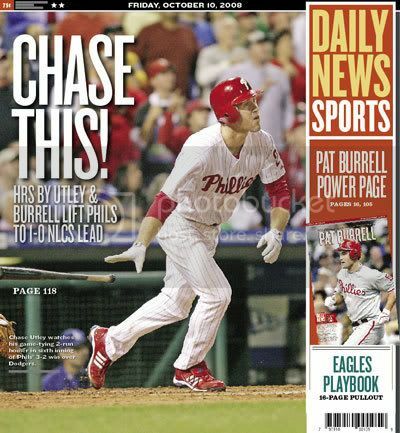 Glad we didn't panic and start Hamels on short rest. Baseball Prospectus now gives us a 37 percent chance of winning the World Series. Let's get there first. But first, an off day, thanks TV! Rays play the Red Sox, up 2-1. 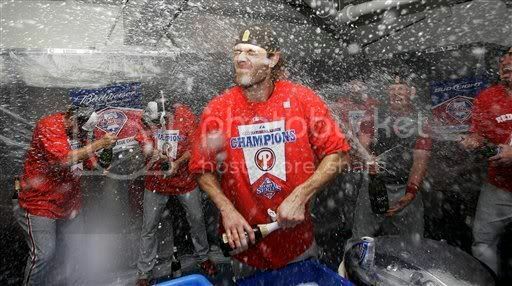 Phils haven't lost an NLCS in 30 years. Trying to make their record in NLCS 4-3 after starting 0-3. Elsewhere: Final debate between Obama and McCain. 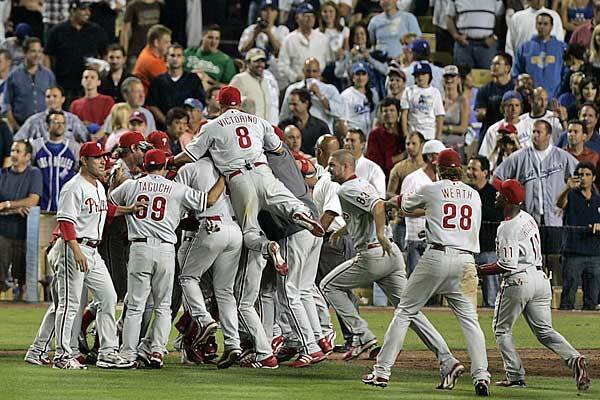 And, even the score against the Dodgers in NLCS's. Losses in 1977 & 78, win in 1983...and 2008? Elsewhere, Boston will try to not be eliminated by the Rays in Game 5. Boston rallies down 7-0, biggest postseason comeback since 1929, sets up Game 6 tomorrow. We have a Where Were You thread going. Red Sox win again, setting up a Game 7. 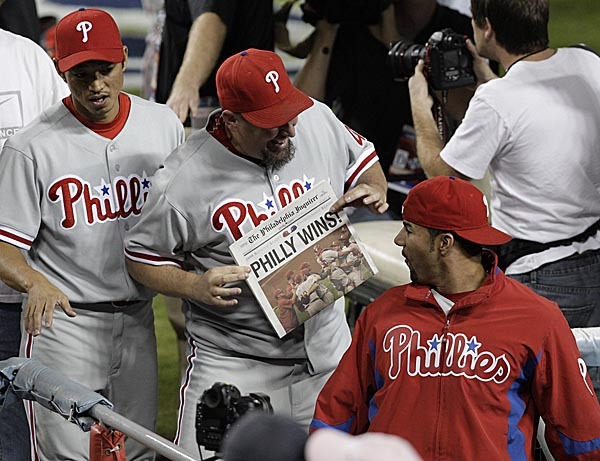 We know whoever wins will be favored over the Phils.